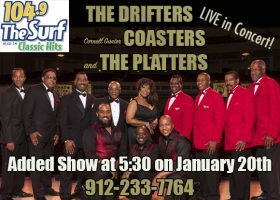 Savannah.com » Events » The Platters, The Drifters and The Cornell Gunter Coasters! The Platters, The Drifters and The Cornell Gunter Coasters! its a party! Jan. 19 at 8 p.m. and Jan. 20 at 3 p.m. and 8 p.m. Savannah Theatre, 222 Bull St. www.savannahtheatre.com.